The Mountain Goat is a common mammal of British Columbia's mountains. David Fraser. 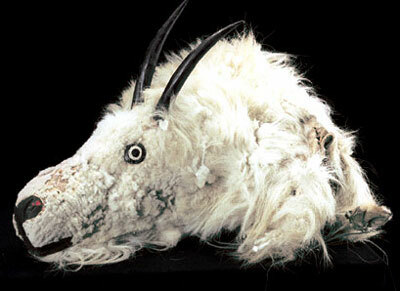 Mountain goats are depicted on First Nations crest objects, and sophisticated techniques transform their wool into garments and their horns into spoons and other items. mask, , Turnour Island. Mountain Goat fur over Western Redcedar. RBCM 17092. 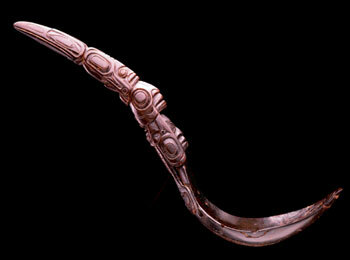 Northwest Coast steamed and bent Mountain Goat horn spoon carved with face, killer whale and bird images. RBCM 13612. 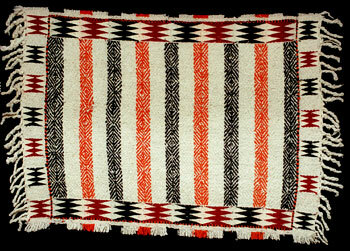 Coast Salish chief's Mountain Goat wool blanket with geometric design, from Musqueam, 1909. RBCM 1189. 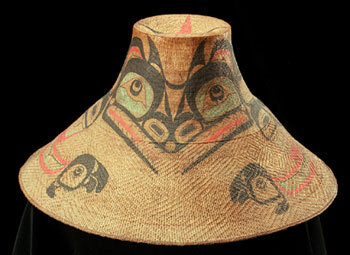 Haida spruce-root hat with Mountain Goat design, from Skidegate, 1897. RBCM 9498 a.